Oct 20 Steel City Connection: Evan Peters As Andy Warhol In "American Horror Story"
If you've been following FX's American Horror Story, you'll know this season focuses on a "cult" aspect. It's over-the-top, heavily political and plays on people's fears (both on the right and left sides of the aisle - that term is hilarious btw, "aisle" - what is this Food Lion?) surrounding the election, the future of the country and the way people handle themselves nowadays, whether that's socially or digitally. Not the most polished of television shows, but like I told Zack on The Keystone Cast, I'll ride this season out to see what happens. 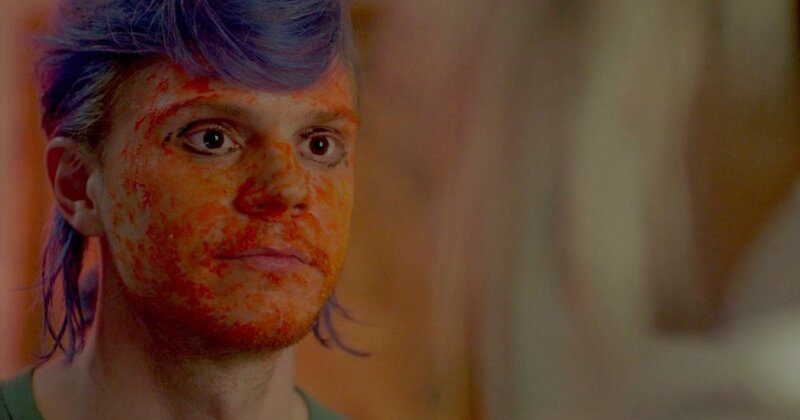 This year he plays the potential cult leader, Kai Anderson, a blue-haired nutjob hellbent on chaos (think of Heath Ledger's Joker, but instead of facepaint and scars he just covers himself in orange Cheeto dust). Still not sure if this is Evan Peters or Warhol yet, but I know I do own that shirt. The entertainment/tongue-in-cheekiness is further perpetuated by casting Lena Dunham as Warhol's attempted assassin, Valerie Solanas, who I knew nothing about until seeing this episode (I'm referring to Solanas, not Dunham, but either would be appropriate - she wrote Girls and potentially exploited a dog, that's all I got). Back to Peters, he did a really jaw-dropping job of Warhol, that was pretty damn accurate and even humorous at some points. If you don't watch American Horror Story, but dig Andy Warhol, I'd recommend seeking out a clip. I tried looking for one on the YouTube, but FX doesn't want you to just see Andy Warhol, they want you to get freaked the eff out by murderous feminists, killer clowns and Billy on The Street. Sep 22 Friday Poll: Who Would Play Mike Sullivan In A Movie?